Spectacular large one bedroom apartment located in a french Style building. 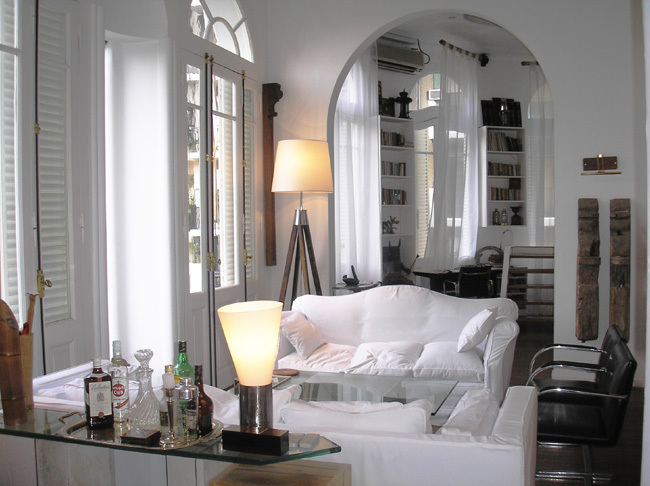 The style and elegance and the tastefully mismatched furnishings make this a delighful place to stay. This apartment has featured many times in design magazines . It has a large living room with two comfortable sofas and armchairs. There is an open fireplace that add an intimate warmth. The dinning area has a large table that seats six. It has a study and library area if you need to work or use internet. There are stairs leading up to a TV room with divan bed and toilette. In the bedroom the chandelier covered four poster bed adds a beautiful touch to this wonderful apartment. There is a complete bathroom suite witch is unique in its design. The kitchen is modern and fully equipped. Balcony with a great view to the Plaza Barrientos. Hardwood floor . Living room with three aircons hot and cold . Fireplace . Internet . WI FI . Cable TV . LCD TV . DVD. Music System . Safe box . Landline telephone . Kitchen equipped with refrigerador , freezer , gas range , gas oven , microwave , toaster , coffe-machine , dishes , kitchen utensils . Bed linen and towels . Cleaning service twice per week . French Style building constructed in 1911. Elevator . The area boasts many restaurants and coffee shops . Included: All bills are paid by the owner.